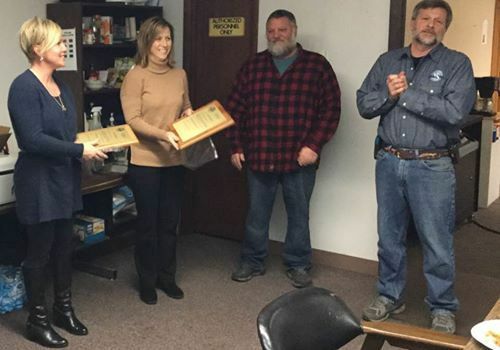 Chris and Bob Higginbotham of All State Manufacturing presented Matandy Steel’s Karen Wolpert and Cindy Amyx with a “Top Notch” supplier award at All State’s Terre Haute, IN manufacturing facility on January 11th, 2017. The Award is presented to a company that exemplifies the qualities we look for in a supplier, excellent quality, great delivery performance, and first class customer service. Matandy’s efforts to meet the needs of our growing company have exceeded our expectations in every way.